Talk about having a crappy day! An unnamed man was rescued from a toilet in Claremont, Cape Town, last week. 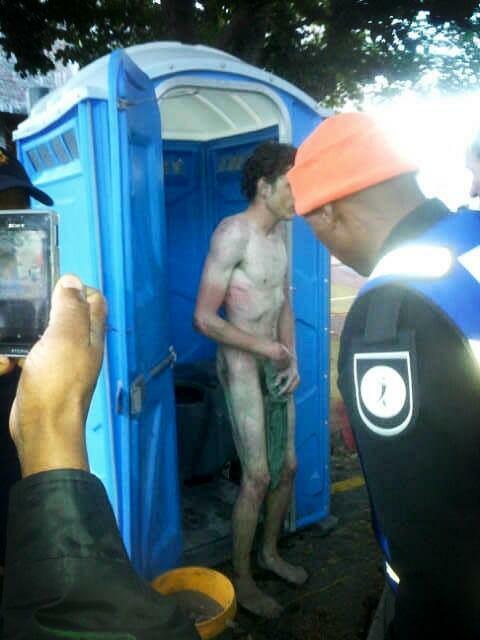 An unnamed man was rescued from a toilet in Claremont, Cape Town, last week. 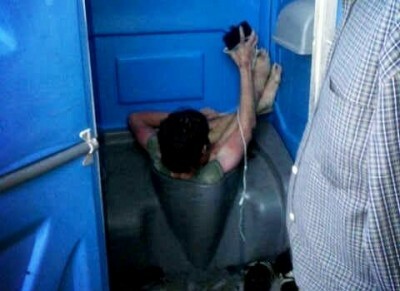 The man had somehow got himself stuck in the bowl of a toilet in a portable loo on a building site. So stuck, in fact, only his legs, arms and head were sticking out! According to Baydu Adams, a Cape Town blogger who witnessed the bizarre situation unfold, passers-by heard a panicked shouting coming from inside the toilet. Upon finding the man, it took about 40 minutes for security, police and some helpful onlookers to find a way to rescue him. “The funny part was that while two or three people were trying to help, others were taking pictures and videos,” says Baydu. Baydu says some of the gathering crowd commented that the man’s eyes were red and he looked high. He couldn’t have been homeless, Baydu adds, because he had an iPhone or iPod with him. We agree, Baydu. We agree. Picture via @MrCPT on Twitter.